On the red cliffs of Mount Parnona there is a canyon that goes into the mountain for several miles and comes out to the Monastery of Elona. 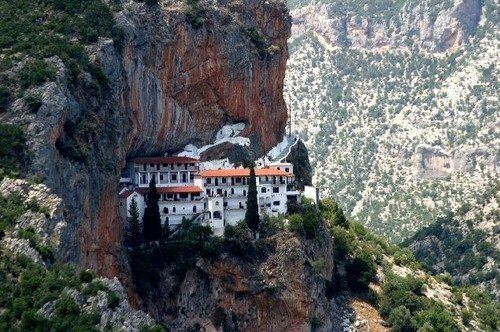 The Monastery symbolized an icon of hope during the Turkish occupation for Greeks throughout the province of Arkadia. The hope that one day the Greeks would be free by the brutal occupation of the Ottoman Empire. It is said that the villagers of Cosmas (a village near Elona) one evening witnessed a bright glow shining from a cliff. At first they thought the light was perhaps a figment of their imagination, yet for the next few nights the light kept appearing, and they knew it was impossible for any human being to be able to physically sit or climb up that rough and rocky cliff, the bright glow came from the icon of Virgin Mary.